Written on December 31, 2009 by Kevin. Sometimes as they say, you are just in the right place at the right time. That happens to be what happened last night when we walked into a local comic book store last night. Rylan has really become interested in all of the superheros so we figured he would enjoy a look around. We didn't know that Vincent DePorter (known for his work drawing Scooby Doo, Spongebob Squarepants and others) was there signing comics and drawing up sketches. He took unique request such as a mash up between Shaggy and the Joker. This prompted me to ask if he could draw a picture of the kids with Scooby Doo. This is the result. Two pieces of custom artwork, made especially for the kids, that they can look back on a long time from now and remember the moment. Written on December 30, 2009 by Kevin. The kids definitely had a lot of fun this year with Christmas. They learned to sing a bunch of new songs and they really took hold of the holiday. Kaitlyn learned from Rylan's excitement that this was a holiday not to miss. As we do every year, the kids had a few parties and gift opening a few days before. They enjoyed the time with their cousins, aunts, uncles and grandparents. On Christmas Eve the kids made Christmas cookies for Santa and then made sure to leave him a few for his troubles. We didn't forget the carrots for the reindeer. The kids were a bit put off though when I told them that Santa may let the reindeer in and they may poop on the carpet. Kaitlyn let out a "ewww stinky" and Rylan immediately wanted to take them off of the plate. They ended up leaving them and also leaving Mrs. Claus a cookie as well. The kids of course woke up to a magical sight when they came down stairs. Grandma was there to greet them and that was just the start of the fun. They didn't seem to have any gifts that were disliked but Kaitlyn did get a scare when she opened Rylan's gift to her and found nothing in it. The gift in fact got caught in the tissue paper that was pulled out in a hurry. Rylan had a big surprise coming to him from Grandma when he opened his big gift which was a Bat Man cave toy. He was thrilled. Kaitlyn's most favorite gift was certainly the vanity that her Great Grandma sent. Santa wrapped up the morning by dropping off two toys of his own which was a new kitchen set and dishwasher. I had made three types of banana bread for the morning so we calmed the morning down by eating together. It wasn't long before we headed back out to eat with both Grandma and Grandpa at Buca Di Beppo. Christmas 2009 is over and I can't wait until next year to see the kid's face of pure enjoyment. Written on December 11, 2009 by Rylan & Kaitlyn. Well this week has been filled with sighting of Santa. First off, both Kaitlyn and I both got a call from him. I couldn't believe it. A few days ago our Dad really surprised us though when he had him give us a video message on the computer. Oh man was it exciting. I just sat there with my hands over my mouth. He talked to us about being good and even showed us what we were really wanting for Christmas. It was great. 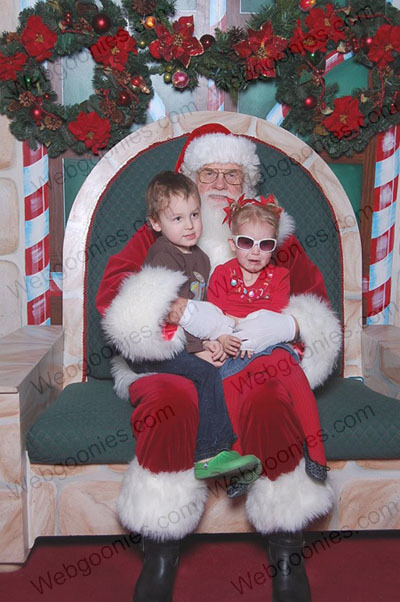 To top everything off though, we headed over to the mall yesterday to actually see the real Santa Clause. Kaitlyn wasn't too excited about seeing him but I sure was. We got to take a few pictures and then I had a chance to tell him what I wanted for Christmas again. I think he is going to come through this year for both Kaitlyn and I. We have been decorating the house for our upcoming Christmas party. We have been making a bunch of crafts like wreaths, snowmen, snowflakes and other goodies.. We have a full line up of fun stuff to eat at the party that Mom and Dad are planning to make. It should be a yummy party just like our last two events. Our neighbor friend that is in need of a kidney has gone into complete failure. We are now seeking hard for a donation. She does get to come home today after being in the hospital for a few days so that is really exciting. She is one of our favorite neighbors so we really want to hang out with her soon. That is gonna wrap it up for the week. Have a good one. Written on December 4, 2009 by Rylan & Kaitlyn. Well of course last week was Thanksgiving and it turned out great. Mom and Dad worked on the food and we had a bit of family over. The food turned out great and everyone had a good time. We got a few gifts to kick off the Christmas season. I got a Christmas themed Wii game and Kaitlyn got a Christmas Strawberry Shortcake movie. We like them a lot. We headed out to do a bit of shopping on Friday. We woke up really early to go to one of the stores. I got woken up and asked why we were awake. When our mom told us why, I responded with "I am going to be tired today" in a very funny tone. The day went great though and Kaitlyn and I didn't fuss one bit. Of course we crashed that night but the day went really well. The next day we made up for it though and had a couple of melt downs. That's just how it goes I guess. We have been hanging out with our neighbors a lot lately. In fact we are going out to dinner tonight and then over to the Phoenix Children's Museum. Both places are said to be haunted so this is our official ghost hunting night. I don't think we will necessarily find any ghosts but I know we will have a good time. Oh ya. Our Mom really put us in a festive mood the other morning when she made us Christmas themed bagels. Whole wheat bagels with green and red cream cheese. She really knows how to make the best goodies. Dad surprised us yesterday too with bringing home a few Christmas Disney coloring pages. He threw in a few other pages too and we focused on staying in the lines. I worked hard at it and just about completed an entire Transformers coloring page. I colored inside of the lines on a whole bunch of different sections. It was definitely something worth keeping. That's gonna do it for this week. It's finally getting cold outside and for the first time we had to turn our heater on last night. It was a chilly one. Written on December 2, 2009 by Kevin. Our friend is currently on the transplant list for a Type O kidney. She has been living on the list for quite some time but has recently been told by her nephrologist that it is time to start looking around for alternative sources. If you or anyone you know would like further information on possibly donating one of your own Type O kidneys, please email me directly at insearchof@webgoonies.com. Like us, she is in Arizona however there are programs that will pay for a donor's travel expenses and hotel while they recuperate. Her insurance would be paying for the procedure.